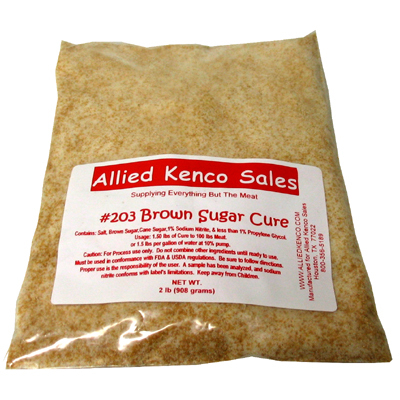 Home > Curing & Brining > Cures > Sugar Cures > Cure - Brown Sugar - 3 Lb. 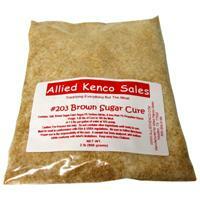 Cure - Brown Sugar - 3 Lb. A cure that is used for hams, bacon, fish, and other meat requiring small amounts of nitrite. Normal usage is 1-1/2 lb of this cure in one gallon of water to make a curing pickle/brine. Then pump or inject pickle/brine into the product in an amount equal to 10% of the weight of the meat. As a rub use 1-1/2 lb for 100 lb of meat. Composed of salt, brown sugar, and sodium nitrite (.75%).